Image of the near-Earth asteroid Itokawa. The boulder-free areas appear relatively smooth and are filled with small, uniformly sized particles. The longstanding mystery of where most meteorites striking our planet come from has now been solved by the first asteroid samples that a spacecraft has ever returned to Earth. This discovery is just one of many unearthed with the aid of the Japanese asteroid probe Hayabusa. Another is that asteroids may be shrinking away to nothing, researchers said. 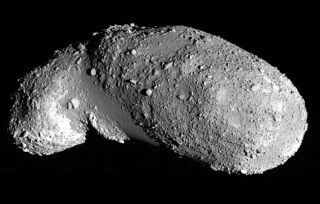 The billion-year-old jumble of rubblethat Hayabusa had visited in 2005, named 25143 Itokawa, is stony or an S-type, the most common kind of asteroid in the inner asteroid belt. Scientists had long suspectedthat the most-common meteorites, known as ordinary chondrites, originated from such rocky asteroids, but as far as telescopes could tell, the chemistry of these meteorites and asteroids did not match. Now this first close look of asteroid samples has solved this mystery by revealing how cosmic impacts altered their surfaces. This scanning electron microscope image shows mineral particles from asteroid Itokawa (red) collected from a sample container from Japan's Hayabusa spacecraft, which visited the asteroid in 2005 and returned to Earth in June 2010. Scientists used a combination of powerful electron microscopes and X-ray diffraction techniques to study the mineral chemistry of Itokawa's surface dust or regolith. Scientists had known the regolith of airless bodies such as asteroids and the moon undergo "space weathering" from solar and cosmic radiation as well as micrometeoroid impacts that can alter their appearance. Past research attempted to account for differences seen between ordinary chondrites and S-type asteroids by studying lunar samples and using that to gauge how much space weathering asteroids experienced. Now, however, researcher Takaaki Noguchi from Ibaraki University in Mito, Japan, and his colleagues find the space weathering undergone by asteroids is fundamentally unlike that seen on the moon, perhaps due to differences in surface composition and the amount of micrometeoroid impacts and solar wind radiation. Scientists detailed their findings in six studies in the Aug. 26 issue of the journal Science. This improved knowledge of space weathering should allow researchers to look at the thousands of meteorites they have collected and match them up with their parent asteroids in space, thus shedding light on the compositions of asteroid types yet to be visited. "This dust from the surface of the Itokawa asteroid will become a sort of Rosetta stone for astronomers to use," said researcher Michael Zolensky from the NASA Johnson Space Center in Houston, a co-author of one of the studies on the Hayabusa findings. The research is detailed in six studies in the Aug. 26 issue of the journal Science. "The particles recovered from the asteroid have experienced long-term heating at about 800 degrees Celsius," or 1,472 degrees Fahrenheit, Nakamura said. To reach this heat, "an asteroid would need to be about 12.4 miles [20 kilometers] in diameter. The current size of Itokawa is much smaller than that, so it must have first formed as a larger body, then been broken by an impact event and reassembled in its current form." "At present, the asteroid is decreasing its size due to small impacts that disperse surface material into interplanetary space and also due to solar wind radiation that sputter away atoms of the outermost layers of minerals on the surface of asteroid," he added. If one were to generalize these findings, "asteroids are on the way to disappearing," Nakamura told SPACE.com. At the rate Itokawa is losing material, it should be gone within 1 billion years. As to what's next, "Hayabusa 2 will be launched in 2014 — three years to go," Nakamura said. "Next time we aim to go to a C-type asteroid and bring samples, much more samples, back home. C-type asteroids are enriched in water and organic materials, and we hope to obtain crucial information on the origin of water and life on the Earth."